It’s the season to get spooky again! This is the perfect period of the year to let your inner monsters out and get playful with scary and chic Halloween nail designs. Here are some simple nail art designs that you could use this season to stand out and adapt them to your mood. Use them for Halloween to match your costume or just for a reason to smile when you look at your nails. Let’s start with something less bloody and more ladylike. For this design, you’ll need a red and a black polish, a makeup sponge, and liquid latex. First of all, you apply the red polish on your nails and allow it to dry for about a minute, then reapply it until you’re content with the intensity of the color. You can apply the liquid latex on the skin that surrounds your nails while the base color dries. This applies to most gradient looks. Afterwards, you’ll apply red and black polish on your sponge and gently dib it onto your nails until you get your desired outcome. You can finish with a shimmering topcoat or a matte one. I do personally believe that we the matte one you’ll get a more classy look. You could use this Halloween nail designs on this day only. If you especially brave, you can wear a long black dress, vampy ombre lips, using the same colors, and become the timeless Morticia . Nothing says Halloween like candy corn. Somehow sweet but with a touch of scary, for those of you who want to remain childish. Your base color will be white this time. On the sponge you have to apply three lines of polish: yellow, orange and white. Candy corn is a pigmented design so be careful not to dib it too much and to keep the lines somehow even. At the end you have to remove the excess and apply a top coat. You can use an orange pigment on your eyelids, do your hair in ponytails, and go trick-or-treating! If you want to get a look that says ‘I just finished hiding the body’ you can go for a bloody nails design. You start with a simple white and innocent base coat. You add the peel off base coat on your skin and then the fun starts. You need a straw for this design. On a piece of paper you put some red polish. You take the straw and dip it that red polish. If you want you can add a darker red as well. The final step is to blow at the end of the straw and let your nails be splattered with fresh bloody polish. If you want, you can use these just for some nails, and add a gradient look for the others, by using your sponge and a red and white polish. If you feel especially dark these evenings, you can get a graveyard design for your nails. You’ll need to get a ombre design which you will apply on your white base color after it dries. You could use a light blue, light purple and a dark navy purple. After you paint those colors on your sponge, the light blue starting at the tip of your nails, you’ll gently dib the sponge on your nails. After you add your topcoat, you’re free to get creative using a nail art brush and black polish and draw tombstones and crosses. Add a purple velvet dress and a black lipstick and you’re ready to go with purple Halloween nail designs. Another gradient nail design is the Jack-o-lantern one. You’ll need a yellow nail polish, a midtone orange and a bright orange polish. 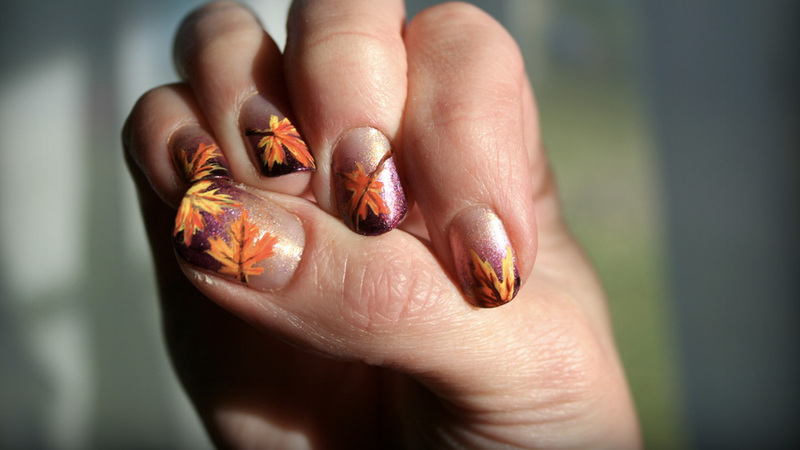 As before, you’ll add them to your sponge and then stamp it on your nails to get a sunset design. Once again, you can get creative with a nail artbrush and draw your creepy pumkins. Finish off with a topcoat and a Jack-o-lantern costume. If you feel really brave, let’s get really scary. You’ll need a dark red and a gray polish. Put a little bit of both products on your sponge and lightly dib them on the top of your nails. Finish with a matte topcoat. Apply a neutral all over your nails until you can only mildly see the colors beneath. Then use a red polish to create a bloody texture from the middle of your nails. Don’t worry too much about cleaning your skin, afterall you’re not going for an alive look. Since we were talking about zombies, we can add something in our nail design which they love a lot, which are brains. You can create an easy gradient nail look by using a white base color, white and red polish for the gradient style and a striper tool to draw some brains on one or more nails, according to your liking. The effect is somewhere between gross and cute. Perfect for Halloween. Tim Burton is my favorite kind of creepy and Sally gives just the right amount of chills down the spine. You’ll need yellow, green and pink polish to create patches on your nails. You can play around with some other colors if you like. The important part here is the stitching effect and lines you’ll create by using a striper tool. You can also use a doting tool to create dots on some patches. Add a matte topcoat and your nails are done. Your makeup could include a lot of blue for the not so healthy look and some stitches. What would Sally be without Jack, we don’t have to know. If you feel the need to dress in a tuxedo and feel like a gentleman, you can use a Jack Skelington nail design. All you have to do is paint your nails all black. Then you get a glitter polish and create a gradient look from the top of your nails. With a nail art brush you draw your Jack. To end it in a ladylike manner, there is the simple option to get a French manicure with a twist. The tip of your nails will have little cats drown onto them with a nail art brush. You have to apply a clear base coat, let it dry and then draw witch’s best friends. Add a dark red lipstick, black leather high boots and a tight black dress. Now you’re classy and ready to outshine other witches with Halloween nail designs. As you can see, there are many Halloween nail designs you can choose from, starting with classy, simple gradient looks to more scary yet playful designs. It’s up to you and how creative you feel. All you need are nail polishes, liquid latex or another peel off base coat. As a tip, there are tutorials on how to do peel off base coats yourself. A makeup sponge is an essential tool to create beautiful gradient or ombre effects. Another tip is that you can reuse the sponges by cutting the part that was used. A nail striper is another tool you’ll need for drawings, and in case you don’t have one by now and you really want to get a certain look, you can cut the brush of a regular polish and use that. All that being said, I hope you make the right choice for your Halloween nail designs and be just who you want to be this Halloween!